Laurel and Hardy at Monrovia Airport. Relive early flying days in Monrovia with an historical review of Monrovia's own Flying Field, a special event on Sunday, April 30, 2 -4 p.m. at the Monrovia Historical Museum, 742 E. Lemon. The event is free to members of the Monrovia Historical Museum and the Monrovia Historical Society. Tickets for the public are $5 at the door. Refreshments will be served. 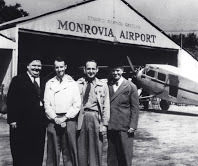 From 1928 to 1953, Monrovia had its own airport, located parallel to Shamrock Ave. south of Huntington Drive. At the airport, pilots practiced their craft, students learned to fly, passengers went for rides, and an occasional movie was filmed. Now, history lovers and flying enthusiasts can relive those aviation years with "Monrovia’s Flying Field, featuring chats with and stories from experts in the history of the Flying Field. There will also be photographs of historic planes, and videos of the Flying Field in action. In addition there will be photos of the McDonald Brothers first hamburger stand, which was at the Monrovia airport. Special guests include Tom Blackburn, son of the airport owner, Al Blackburn, and Gary Boen, airport historian and collector of more than 1,000 photos and papers on the airport. The event is co-sponsored by the Monrovia Historical Museum and the Monrovia Historical Society. Both organizations have decades-long history in preserving and presenting local history. The Museum contains exhibits on the Flying Field as well as the founding of Monrovia and its early history. It is open Thursdays and Sundays from 1 to 4 p.m. The Society oversees the historic George Anderson House and oversees the Monrovia Legacy Project. The Legacy Project is digitizing the city historian’s collection which will be shared online and through the Monrovia Library.